There is highest road in Japan at Mt Norikura to be able to ride a bicycle. The highest point is 2720m. Therefore Mt Norikura is acknowledged as “Sanctuary hill climb”. Norikura Echoline （Prefecture road 84） from Sanbondaki to Tatamidaira is opened from July 1st to the end of October for 4 month. Mountain view and landscape are amazing so, Mt Norikura attracts all cyclist. ‘Mountain cycling in Norikura‘ which is a competition of most famous hill climb in Japan is be holding on the end of August every year. Champion is acclaimed as the ‘mountain god'(Yamano Kami). Some cyclist enjoy crossing Mt Norikura from Norikura Kogen of Matsumoto city to Hirayu of Takayama city by going through the Norikura Echoline and Norikura skyline Via top of Mt Norikura Tatamidaira. Last year many students and foreigners stayed Guesthouse raicho to crossing the Mt Norikura by bicycle. Guesthouse Raicho has well organized guest kitchen. Guests can cook yourself and Raicho provide the self-breakfast for 500yen per person. There is garage in our building to put your bicycle. Please refer to the below for detail. People who loves bicycle want to visit Mt Norikura. We are very welcoming the guests who loves mountain cyclist. Please note that bicycle need to ride left side at Norikura echoline and please follow local rule. There are also special moutntain bike trail in Norikura Kogen. If you want to ride a special trail, you need to join guide tour. For detail, please see the below article. How about stay more than 3 days or week in guesthouse to enjoy the cycling and hiking ? Norikura Kogen is wonderful place to enjoy many activities. 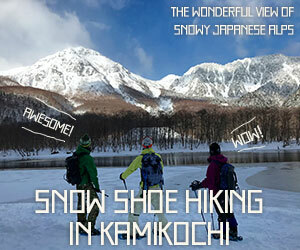 The below is hiking information around Norikura Kogen, Japanese alps.